Lebanon, OH – Defending Ohio Sires Stakes champion Wittyville has returned for his sophomore season in the same fine form he displayed in his rookie year when he banked $207,153. 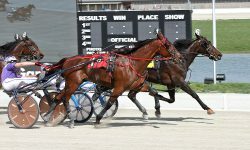 The 3-year-old Manofmanymissions colt completed a sweep of the $15,000 elimination and $40,000 championship round of the James K. Hackett Memorial for state-bred male trotters on Tuesday afternoon (April 16) at Miami Valley Raceway. Wittyville won a narrow decision in the $40,000 Hackett Memorial championship for sophomore Ohio-sired trotting colts at Miami Valley on Tuesday. Conrad photo. Driver Chris Page was content to get away fourth during the initial quarter in :29, then moved into second-over position behind stablemate Dylan The Great (Dan Noble) as the field passed the half in :57.4. Nothing changed during the third quarter, although the leader Westfiftysecond (Anthony MacDonald) was forced to put the pedal to the metal during the entire :27.3 panel. Although the tempo slowed, the desire to win didn’t as a cavalry charge to the wire developed through the length of the stretch. Wittyville angled three wide for the final drive and pushed a nose in front with 100 yards to go. Never Say Uncle (Brett Miller) never did say “uncle” and finished second by the narrowest of margins, while Otsego (Kayne Kauffman) and Yes (Josh Sutton) also closed well to secure automatic bids to the $50,000 Scarlet and Gray Invitational for Ohio-sired trotting colts on Saturday (April 27). The final clocking of 1:55.4 represents a new lifetime best for Wittyville, who is trained by Ron Burke for Burke Racing Stable, Knox Services of Mt. Vernon, Ohio (also the breeder) and Weaver Bruscemi. Driver Brett Miller, with ten wins over the past two days, has opened up a comfortable lead on Trace Tetrick in the 2019 Miami Valley dash derby. Through 72 programs of the 87-day meet, Miller has reached the winner’s circle on 151 occasions, eleven more than Tetrick, who has returned to his home base at Harrah’s Hoosier Park, but is still competing at Miami Valley on dark days in Indiana. Dan Noble and Chris Page have been winning at an impressive rate in recent weeks, as well, and are a strong third and fourth in the standings. All four reinsmen have exceeded $1.2 million in purse earnings at Miami Valley in 2019, topped by Miller at over $1.5 million.